The 2019 Ford Taurus is a unique full-sized sedan that looks amazing from front to back. When you drive around Hampton, you'll be able to take pride in the appearance of your vehicle. Wynne Ford is happy to show you all of the different features that set this sedan apart from the rest. The HID headlamps are bright, bold, and fit perfectly into the sleek design of the front of the car. For additional safety, they can be set to turn on automatically when they sense a low-light situation. They'll also turn on when you engage your windshield wipers. 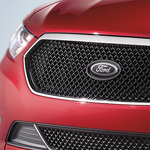 For rear visibility, the Ford Taurus comes with LED taillamps. These lights are designed to use less energy while being brighter than traditional taillamps. They'll ensure that anyone coming up behind you knows that you're there. The dual chrome exhaust tips also add style to the rear of the car.